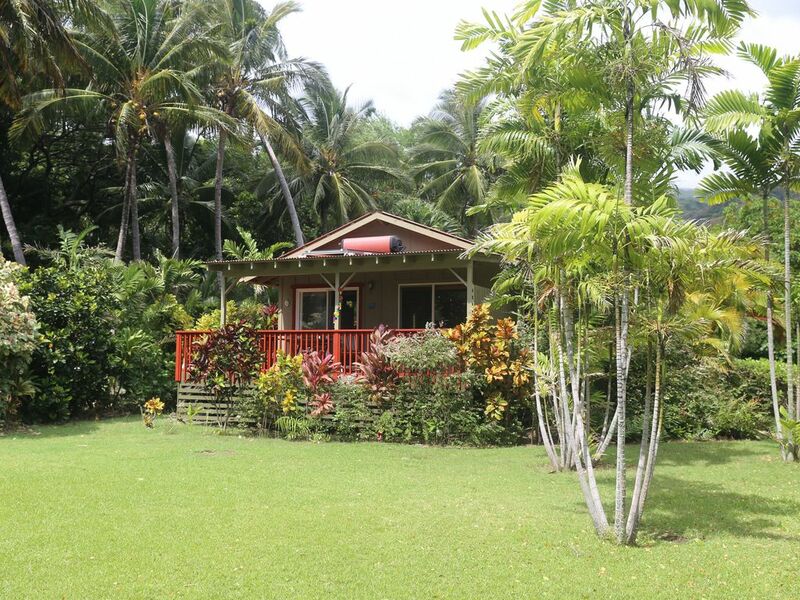 This is a beautiful beachfront studio cottage on the lovely Hawaiian Island of Molokai. It is situated on an oceanfront estate of almost two private acres, with over 450 feet of beach front. There are panoramic views from the deck of the ocean and of Maui across the channel. There is a reef off shore, which protects the shoreline waters, providing swimming and snorkeling year-round. We are located on the lush end of Molokai, which is considered by many to be the most beautiful area of Molokai. We are on of the few properties on Molokai located way off the road, offering maximum quiet and privacy. We are over 500 feet away from the road. You can not see any neighbors!! This is truly one of the most beautiful properties on Molokai. The cottage shares the property with a larger home that is also for rent (see VRBO Listing #247907). They are separated by lots of privacy foliage. The house and cottage are actually more private from each other than many other rentals are from their neighbors. The cottage has been designed with the aesthetic at heart and an attention to detail. It has high ceilings, wood floors, charming colors, a complete kitchen, and full bath. It is fully and elegantly furnished with beautiful teak furniture, a leather couch, and a comfortable king size bed. The deck has a teak table and chairs set, plus two comfy patio chairs and an unobstructed view of the ocean. In addition, there are lounge chairs on the beach for your enjoyment. The landscaping creates the feeling that you are in a park on the beach. recommend that guests purchase travel insurance. 1. Quiet hours are from 9:00 p.m. to 8:00 a.m., during which time the noise from the short-term rental home shall not unreasonably disturb adjacent neighbors. Sound that is audible beyond the property boundaries during non-quiet hours shall not be more excessive than would be otherwise associated with a residential area. 2. Amplified sound that is audible beyond the property boundaries of the short-term rental home is prohibited. 3. Vehicles shall be parked in the designated onsite parking area and shall not be parked on the street. 4. No parties or group gatherings other than registered guests shall occur. 5. NOTE: The shoreline area is the property of the people of Hawaii, and is open for the free use by everyone. 6. There are Fire Escape Plans posted in each bedroom. Please familiarize yourselves with the exits and the location of fire extinguisher. 7. Please, no smoking inside the units. If you smoke, please smoke outside and carefully dispose of the cigarette butts in the outside trash. 9. Check in time is 3 pm, Check out time is 11 am. The cottage is just perfect for a romantic getaway. The property is gorgeous and well-maintained. We loved spending morning on the covered deck, sipping coffee and looking at the trees and the ocean and listening to the birds. There is a larger house on the property (visible only from the side window), but while we saw the occupants' car appear and disappear, we never saw nor heard them, so the property truly feels secluded. Communication with Jessica was fantastic. We felt well-prepared prior to arrival, and she was so accommodating. We can't wait to return. Great property, responsive and kind owners, and a beautiful, relaxing island. This place is very much worth a visit. The cottage was comfortable and well-appointed, exactly as advertised on the site. We never got tired of the view of the ocean and Maui across the channel. The landscaping and consistent breeze kept the cottage from getting too warm, even in the heat of the day. Although there was another couple staying in the main house at the same time we were in the cottage, we never heard or saw them except when we happened to be on the driveway at the same time. Potential renters should be aware that Moloka'i is a very slow-paced island without a lot to do, and that the cottage is about a half-hour from the one main town on the island. But for those who really want to get away from it all, this cottage is a great choice! Wonderful relaxing place to unwind. Super hosts. Very well stocked and comfortable cottage. Words seem empty in expressing the feelings I experienced here. Healing in so many ways. Mahalo. The cottage was lovely and simple. Very nice pillows!! Amazing view and great location. The property was very well groomed, and there were coconuts everywhere!